Preparing for a new baby is relatively straightforward – there are lists online of what to buy, you attend antenatal classes & there is a whole lot of support out there for you! Preparing a Toddler for a new baby is slightly more daunting! 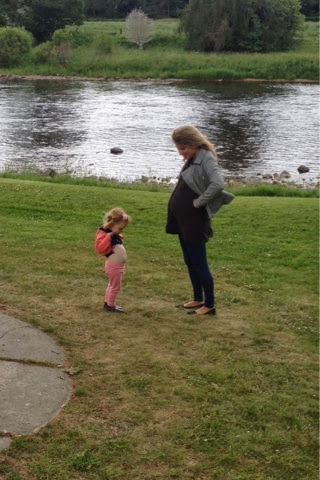 We started preparing Mini Meldrum for the arrival of her little sister early on – from about 12-15 weeks. I had HG so wanted her to know why I felt so poorly and why I was constantly vomiting & a bit of an un-fun Mummy. We started off by purchasing a selection of books & then also received a couple from friends so we have a fair old collection. 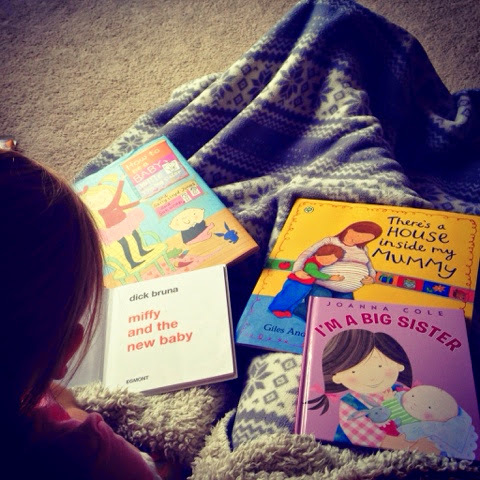 After we had read one of the books for the first time I asked Safiyah if she would like to be a big Sister? Her response was a huge grin & a very enthusiastic “Yes”… so that was the hard part. We then explained that Mummy had a baby growing in her tummy & that’s why she was feeling poorly & very tired & also why we have to be very careful with mummy & more gentle around her tummy. get toddler talking to bump/giving kisses & explaining that her new sibling is growing in there but can hear her. Safiyah has embraced the whole baby thing way more than I ever thought she would at 2. She often asks to feel the baby kicking, has conversations about what colour hair she will have (blue or pink incase you’re wondering) & loves helping me ‘organise’ the baby clothes. I rarely take Mini Meldrum shopping with me but the few times she has been recently she has asked to buy things for the baby & picks out outfits etc for her! We talk about the baby with her daily & discuss how S can be Mummy’s helper when the baby is here & help dress her & change her nappy! All of which greatly excite her… I’m sure the novelty of nappy changes will soon wear off once Baby Meldrum arrives. I have let S be involved as much as possible with everything baby & pregnancy related… she drags out the bibs & sleepsuits daily & as much as it winds me up having to re sort everything I would rather she felt comfortable with all the baby gear & showed enthusiasm & excitement about it all. I think it has really helped her knowing that the baby is going to be a baby girl & now also giving her a name as S talks about her as though she is already here & mentions looking forward to holding her “when she’s ‘borned'” and sharing ‘only some’ of her toys with her. It really is lovely to see her so excited by it all & we can only hope that this feeling stays after Baby Meldrum’s arrival!! How did you prepare your child for a new baby & how were they upon their sibling’s arrival? Aw, sounds like Safiyah is going to be an awesome Big Sister!! We did all of this and have had next to no jealousy. The bond between the two of them is so wonderful, it is a lovely age gap to have!